Well run park with plenty of trees. Level gravel sites. Friendly helpful management. We camped at Lost Alaskan RV Park in a Fifth Wheel. Nice park, very clean. Stayed only one night while traveling. All gravel and level. No shade to speak of. Far enough from the highway so it was quiet. Restrooms, showers and pool were spotless. Very friendly managers. We camped at Adobe Sunset RV Park (formerly Adobe Village RV Park) in a Fifth Wheel. 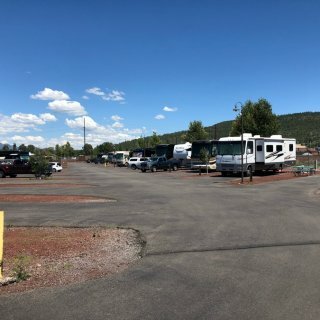 The best RV Park in Flagstaff. Very friendly and helpful staff. Clean, clean, clean! Small park that caters to seniors. Some highway noise from highway 89 but no trains or interstate noise. Will visit again. Level site with full hookups. Lots of friendly campers. We camped at J & H RV Park (55 + Park) in a Fifth Wheel. Nice clean park. Sites are asphalt and level. Full hookups including 50 amp. Staff is very friendly and helpful. WIFI works well along with cable TV. A little bit of train noise but it did not detract from the stay. They have a kennel but no dog runs. Spaces are a little close together but not bad. We camped at Grand Canyon Railway RV Park in a Fifth Wheel. Grand Canyon Brewery right across the street. One night stay on the way home. Clean, well maintained park. Right off Highway 89 central to Grand Canyon, Zion and Bryce. Full hookups including 50 amp. Good WIFI and no cable but several OTA channels available. Level, gravel site. Clean pool and dog run. Would stay again. We camped at Kanab RV Corral in a Fifth Wheel. Nice clean RV park. Level site with gravel. Full hookups with 50 amp. About half of the sites are pull through. Handy restaurant on site. Good WIFI but no cable. Right on the highway so a little road noise. Scenic valley. We camped at Wolf Den RV Park in a Fifth Wheel. High price is based on the location - it's a great location. Good service and nice level gravel site with 50 amps, good WIFI and cable. Sites are a little tight but workable. Also a little tight getting in and out. We camped at Fireside Resort - Jackson Hole Campground in a Fifth Wheel. One of the nicest RV parks we have ever used. Clean, clean, clean! Great service. Level concrete pads. Two sections - one is adults only. The section that permits kids tends to have nicer sites with well manicured grass. 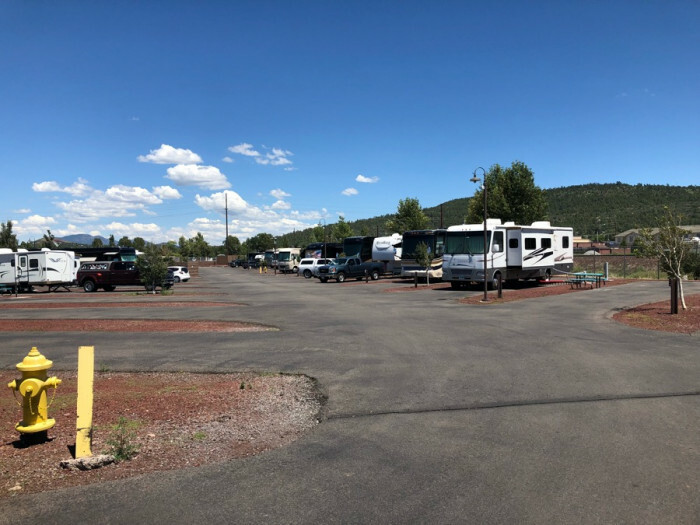 We camped at Mountain Valley RV Resort in a Fifth Wheel. Well run RV park. Very clean. Sites are mostly level gravel. Our site had a nice grass area, a fire ring and new picnic table. Full hookup with 50 amp. Wifi works well. Will come again. We camped at Ruby's Inn RV Park and Campground in a Fifth Wheel. Clean, well maintained campsites. Great scenery and lake activities available. National Park facility which requires an entry fee. Campsites are mostly full service with 50 amp. Sites are spread out, asphalt and level. Folks with boats took up a lot of the excess parking but there is plenty of room to spread out. Most sites have some shade. We camped at Wahweap RV and Campground in a Fifth Wheel. Not up to KOA standards. Would be a decent park at $35 vice $70. Spaces are tight, gravel and dirt with little grass, close to each other and not very level. Road through the park are narrow. Laundry was clean but restrooms and showers could have used some work. Friendly helpful staff. 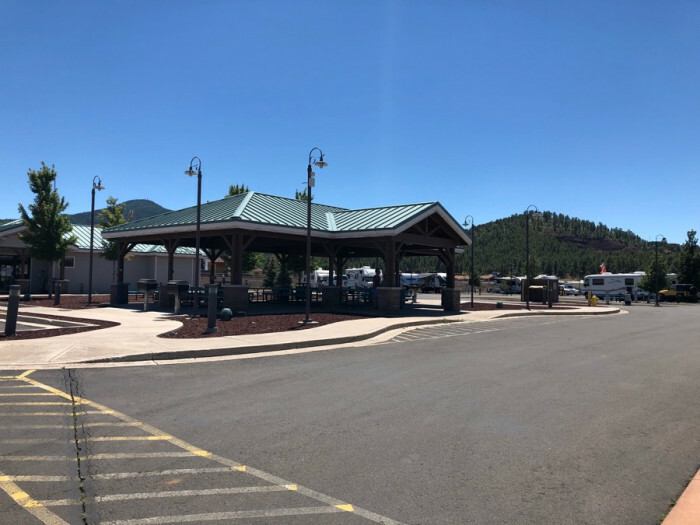 We camped at Flagstaff KOA in a Fifth Wheel. Gem of a campground. All sites paved and level. Many great walking paths. Red Head and Mallard are probably the best loops. Not many 50 amp sites but its generally cool with little need for air conditioning. Almost all sites are back in. Nice lake for fishing. Restrooms and showers very clean. Sites go fast - reserve early. We camped at Fool Hollow Lake Recreation Area in a Fifth Wheel. 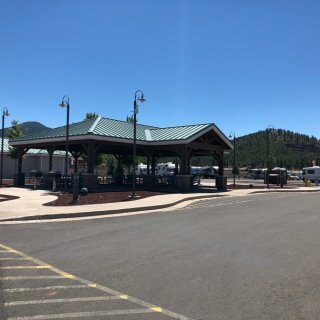 Plenty to do in Show Low.